Retracing the Sonoma - Napa County Boundary | Adobe Associates, Inc.
As time goes on evidence of historic surveyed lines can become clouded, lost, obliterated, destroyed. That is a fact with which the survey community is intimately familiar, whether we work in the public or private sectors. In Sonoma and Napa counties one such line is the common boundary between them. Those of us in the private sector have long known that surveying boundaries adjacent to the county line can be difficult and expensive due to the lack of sufficient evidence. Original monumentation dates back to 1877 and was sparsely set, generally a mile apart, in often fairly rugged terrain. From copies of the field notes for this line, on file in the office of the Sonoma County Recorder and the State Lands Commission, we know, J. T. Kingsbury, Deputy Surveyor under direction of the California State Surveyor General, William Minis, began his survey of the Sonoma/Napa county line at the summit of Mount St. Helena and set iron stakes 3 feet long, 3 inches wide and 3/4 inches thick, with an “S” cut with a cold chisel on one side and an “N” on the other side. Where available he also blazed trees with three notches cut across the blaze. 52 iron stakes were set along the 52 miles of his survey, generally one per mile. His beginning iron stake was set at the summit of the mountain, 107 feet southeast of the US Coast Survey Signal Station set the previous year (1876) as a fine drill hole and cross, cut on top of a 1/2 inch copper bolt cemented in bedrock and projecting 1/4 inch. This station was last recovered in 2003, as described, and is designated as National Geodetic Survey PID (point identification number) JT2703. Some of the original 52 monuments set by J. T Kingsbury in 1877 have been destroyed by construction of fire trails and other activities along the ridge. A few of these monuments have been found intact, some found destroyed and their positions re-established (not always clear how) and appear on recorded maps of individual boundary surveys. However the distance between original monuments still remaining has rendered their re-construction more expensive than most property owners have been willing to take on. 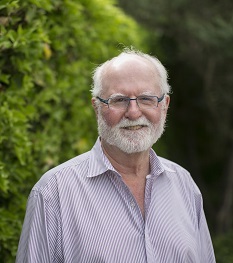 In at least one location a boundary line agreement between vineyard owners on both sides of the line was entered into due to the “excessive” cost of locating the line, “until such time as a more defin¬itive survey could be undertaken”. For many years, it has been the desire of the Sonoma County Surveyor’s office to re-construct this historic line. In order to do this, it would be necessary to locate original monuments and any other evidence of the original survey (where still existing), re-construct evidence where missing, re-run the approximately 52 mile line, and provide additional new monumentation. 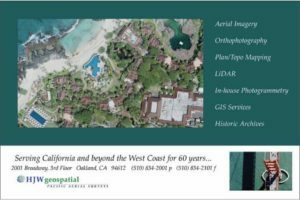 This would perpetuate the original survey for use by the private surveying community, for current and future surveying along the dividing ridge, as well as providing accurate controls for use up and down the Sonoma and Napa Valleys. A survey of this magnitude would be difficult to fund, require extensive research, and certainly be beyond the scope of most private firms, at least without substantial public funding. Some initial investigation was begun by county staff some years ago and it was thought the County of Sonoma would undertake the endeavor, but funding, personnel and other priorities kept the survey from moving forward. So the challenge of financing a re-establishment survey of the entire historic line was going to be difficult, but that issue would need to be addressed, if the survey was ever going to be undertaken. As it turns out such a source already existed. 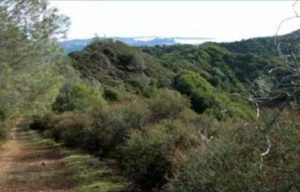 The Sonoma County Board of Supervisors established the “SURVEY MONUMENT PRESERVATION FUND” in fiscal year 1990-1991, by ordinance No. 4182, in conformance with Section 27585 of the Government Code. Government Code Section 27584 states “The board may establish a survey monu¬ment preservation fund to pay the necessary expenses incurred or authorized by the county surveyor in any retracement or remonu¬ment survey of major historical land division lines upon which later surveys are based, such as, but not limited to, government section lines, rancho lines, grant lines, rancho section lines, acreage subdi¬vision lot lines, and subdivision boundary lines within such county. County Surveyor, in an advisory capacity. Through the activities of this committee and the County Surveyor, a formal process was established for application by private survey firms, for the funding of “appropriate” projects, to preserve monuments and lines of significant public value. In normal practice, local surveyors aren’t usually looking to create work, but are busy serving existing clients. As a result, the fund has not often been used. So, in order to move the discussion of reconstructing this historic line forward, in early 2009 application was made by Adobe Associates, Inc., through Paul M. Brown, PLS, principal, for the gathering of back­ground research and documentation, and preparation of a “draft” propos­al for the retracement of the 1877 J.T. Kingsbury survey of the Sonoma/Napa county line. The contract for this application was signed in early April 2009 and in late April 2009 the “PROPOSAL FOR SONO­MA/NAPA COUNTY LINE RE-TRACEMENT SURVEY” was deliv­ered to Gary O’Connor, Sonoma County Surveyor for review. The report called for establishment of a control network of monuments along the length of the dividing ridge, followed by re-construction of the surveyed line with appropriate mapping and reports being filed in both counties. Recommended specifications for a GPS control network were included. Integral to the proposal was utilizing multiple private survey firms for prosecuting the work, with suggestions as to how many firms might be coordinated in undertaking the effort. Considerable time savings would be gained by using multiple firms, and coordination of these firms, while potentially difficult, was not considered insurmountable. Each section of work would be set up to be run as independently as possible to ease the coordination challenges. As independent as surveyors usually are, a com­mon purpose was thought to trump that bent. At least that was the hope. What a novel idea: many different firms working on the same project, coordinated by the County Surveyor. Following review and approval of the draft project report by the Sonoma County Surveyor and the CLSA Monument Preservation Fund Committee, the County Surveyor obtained the support for the project and its’ funding by the Board of Supervisors of Sonoma County and the rest of the pertinent county staff. 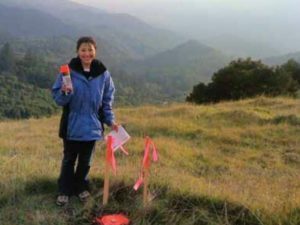 Once that was in place, the county surveyor called for submission of STATEMENTS OF QUALIFICATIONS from any private survey firms in Sonoma County (including a few from Napa County known to have surveyed along the ridge) interested in participat­ing in the project. Firms from outside the area would not be considered. County funds should stay in the county. Napa County, without a monu­ment preservation fund, was unable to assist in funding of the project but the Napa County Surveyor’s office agreed to waive fees for processing of required “Records of Survey”, as that county’s participation (as it hap­pens, not a small amount). So, for those of you readers with a penchant for history and “evidence” let me fill in some of the background for this particular project, following which I will return to this story. On January 4, 1850, the California constitutional committee recom­mended the formation of 18 counties. The current number of counties was achieved over time by subdivision of many of the larger counties into smaller ones. The last county to have been established is Imperial County in 1907. Napa County is one of the original counties, created in 1850 with parts of the county’s territory, together with parts of Mendocino County, being given to create Lake County in 1861. “He shall make an accurate and complete survey by astronomic observations and linear surveys, of the boundaries of the State; He shall make an accurate map of the State; He shall survey and, when necessary, designate by plainly visible marks, or monuments, and shall describe on the map of the State, the boundaries of the several Counties; The Surveyor General shall be chief engineer and commissioner of internal improve­ments; He shall deliver to the Governor annually his report.” The office of Surveyor General was eliminated by Chapter 516, Statutes of 1929, with the duties being transferred to the Division of State Lands in the newly created Department of Finance. In 1938, all responsibilities of the former office of the Surveyor General, and which from 1929 to 1938 were held by the Department of Finance, were transferred to a new inde­pendent agency – the California State Lands Commission. I have the honor to transmit herewith a map and field notes of a sur­vey of the boundary line between Napa and Sonoma Counties. The survey was made in strict conformity to the Statute. I found that the ridge divid­ing Clear Lake and Russian River Valleys was at the nearest point about six miles from the Fitch Ranch. I suppose from what Mr. Nathan Coombs told me and my own observations that the ridge intended by Napa as the boundary is the spur dividing the Fitch Ranch from the small valley at the head of which lives Mr. William McDonald. But the law expressly says that the line shall follow the ridge dividing Clear Lake from Russian River Valleys to a point on the top of said ridge one mile east of Fitch Ranch, not one mile from the ranch. I followed down the ridge until I was one mile east of the NE corner of the grant, which was the nearest point in the eastern boundary. I there established the NW corner of Napa County, and ran the line to the head of Huichica Creek. I have been very careful in lay­ing down upon the map, all the ridges, spurs, creeks, etc. so that a perfect idea of the topography of the county can be gained. I will take occasion to say here that the work took twice the time contemplated. It was cer­tainly the roughest and most difficult survey I have ever undertaken. I was present with Col. Norris on the work nearly all the time. The cost of the work was much greater than he anticipated. He asks through me that the Board make an allowance of $300 more than the stipulated price. I think he is justly entitled to this. The number of miles run was more than 100. The line from the NW corner of Napa to the head of Huichica Creek is 47 miles. This had to be connected back. Lines had to be run to fix the posi­tion of the Fitch Ranch, the Head of Huichica and the US Township lines were carried up to the corner in order to make calculations for the bear­ing of the line. At the prices paid by the US for township lines, the work would amount to $1,500, and to about the same by the fees allowed County Surveyors. “In the suit cited here regarding the location of the county line, it was argued by counsel for the defendant, the Legislature alone can estab­lish county boundaries; the act under which the surveyor-general acted is unconstitutional, if it be so construed as to hold that the action of the sur­veyor-general was conclusive. 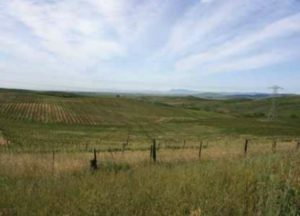 The question in this case is as to the conclusiveness of the survey of the boundary line between Sonoma and Napa Counties, as approved by the surveyor-general of the State. The Court below held that it was con­clusive, and refused to hear evidence to contradict the survey. From the response to the request for “Statements of Qualifications”, eighteen firms were selected as qualified for the project and were called to a meeting in September 2009, to map out a process for implementation of the proposed project. It was the intent of the county surveyor that each qualified firm would have a piece of the work. From that meeting, four firms were selected at random for the establishment of the control net­work – Adobe Associates, Inc, Santa Rosa; Crabtree Land Surveying, Healdsburg; Michael Ford, Inc, Kenwood; and F3 & Associates, Petaluma. These firms would establish the GPS control network (project Phase II), and the other fourteen firms would each have a portion of the retracement survey (project Phase III). With numerous jokes about herd­ing cats on a mountain, the project was underway. specifications, and agree to a final plan for the control portion of the sur­vey. Two of the firms retained outside consultants to provide additional GPS expertise for their firm, which greatly aided the creation of the final specifications. At the initial meeting of these firms, with two representatives from each, and following a discussion of the draft project proposal, it was agreed to form a smaller GPS committee to go over the specifica­tions for the control work. Following agreement that our contractual work had begun and the time included in each firms contract, the GPS committee was formed with a representative from each firm. The specifica­tions were worked over, massaged and finally agreed to by the committee made up of: Leonard “Gabe” Gabrielson, PLS for Adobe Associates, Inc.; Mike McGee, PLS for Crabtree Land Surveying; Reg Parks, LSIT for Michael Ford, Inc.; and Fred Feikert, PLS for F3 & Associates, with Gabe acting as scrivener for the committee. Following agreement of a process for prosecution of the field work for each section, coordination between sections and project deliverables, each firm prepared their contract proposal for submission to the Sonoma County Surveyor’s office for approval. Each section of the work was intended to be set up for completion in as independent a manner as possi­ble, each section running its own adjustments, with a final total network adjustment to be run as a check and to provide final coordinate values for use in each firms mapping. It was agreed to have Mike McGee run the final adjustment, with each of the other firms taking their own shot at running a total network adjustment and comparing results. For those of you most fas­cinated with the details, and hoping not to turn away those who are not, I have included the project specifications at the end of this discussion. Contract proposals were developed following the guidelines established for use of the Fund, and delivered for review and approval by the County Surveyor. 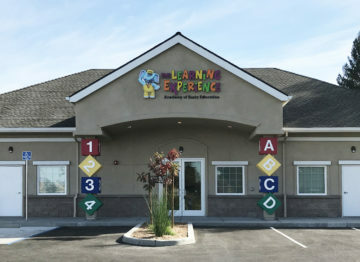 For this project a separate committee of private sur­vey practitioners from Sonoma County, (not included in this project), acting as advisers, was convened by the County Surveyor to review these contracts. With some minor requested revisions, the contracts were agreed to and the work authorized. The GROUP OF FOUR was encouraged to consider using some stu­dents from Santa Rosa Junior College in their project work, if it seemed appropriate. And so a number of students from Jerry Miller’s Surveying Technology program at Santa Rosa Junior College were invited to partic­ipate in the project by two of the firms as a means of providing an enlarged view of the profession. Beau Immel, David Slatter, Greg Pfeiffer, Tiffany Tatum, and Eli French, all JC students, worked on Sections II & III. By the time the control project was concluded there were some excit­ed students on campus, with an elevated status as “paid surveyors”. By the end of December 2010 the control monuments were set and the GPS field work complete. The final adjustments were completed in January and in February/March the Records of Survey were in process for County Surveyor reviews in both counties and subsequent recording. It had been recommended and agreed by both counties to record the maps in con­secutive order from Section 1 on the north to Section 4 on the south. A com­mon coordinate system for control of the total line was now in place. JIM CRABTREE, PLS, “For me, this project has been as much about the people involved as the survey itself. I had not had the pleasure of meeting Fred Feickert until our first control group committee meeting. The other surveyors on the project, although known to me before, have become more like friends and co­workers as we resolved the coordination and technical issues as a group. We worked with my good friend Michael McGee, who assisted us with the GPS specs and adjustments. I was also able to include my son who was on winter break from the Geomatics program at OIT. Surprising to me, the landowners whose cooperation was very much needed, were particularly helpful. There was the winery owner who still had a positive attitude, despite having spent years and lots and lots of money dealing with dual County jurisdictions and not knowing just exactly where the County line is (and still not have the winery built). There were some owners I never met face to face. One property owner turned out to be my dentist and he gave me the phone number for his neighbor, an absentee owner. These don’t seem like big deals, but when you have a small window to complete several days’ field work, it’s criti­cal to have the access figured out. I do regret that I didn’t make more of an effort to include the SRJC students in our fieldwork. My only other regret is that I didn’t prepare for doing a little recreational corner searching on my own. Some of our points should be close to Kingsburg monuments. On February 24, 2010, the other fourteen firms were called to a meeting to match firms with each of the fourteen sections. As of this writing, proposals/contracts for each of these sections are underway. OVERVIEW: The Phase II survey for the GPS Control Network covers a linear north-south path of about 40 miles. The Primary Network has been partitioned into four areas or Sections (four companies) of approximately 10 miles in length. Each Section will be a sub-network within itself. The lengths and boundaries between the Sections have been determined by the Sub-Committee (made up of the four companies) performing the GPS Control Network with the intent of equitably distributing the work. It is expected that that each company will perform the survey of their assigned Section on their own schedule. The survey plan for developing a network for each section is discussed hereafter. 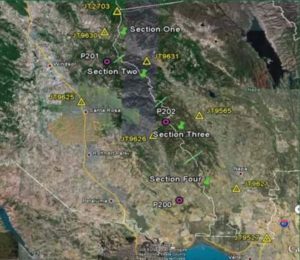 The primary control and constraints for the network will be three CGPS (Continuous GPS) stations published by the California Spatial Reference Center (CSRC) with NGS sanctioned NAD83, 2007.00 Epoch positions listed below. The CGPS stations, similar to the NGS CORS, are published on the CSRC web site () for California. The Sections, CGPS stations and HPGN stations are shown on a map at the end of this document. SECTIONS: The Sections are numbered sequentially from north to south as Section One, Section Two, Section Three, and Section Four. These Section numbers will be referenced in all communications. New control points will be established about every 2 to 3 miles in each Section. Points in each Section will be assigned point numbers for identification within a range as listed below. For HPGN station identifications, use their NGS PID. HPGN: In addition, to confirm and report on the network compati­bility of in-the-ground HPGN monuments, the following will be included in each Section’s survey. The HPGN points were assigned based on their proximity to each Section; however, the Committee has the option to change these assignments. The nearest control point to the boundary between adjacent Sections will be selected for a Tap Point. The Tap Points will be included in the GPS survey networks of adjacent Sections and are intended to provide a common connection between the sub-networks. Each company will set and survey the Tap point on the south side of their Section and include the Tap Point on the north side in their survey. Note, there are no Tap Points on the north side of Section One and the south side of Section Four. Companies performing surveys in adjacent Sections will necessarily need to coordinate their efforts in regard to Tap Points. independently of each other will occupy the new points, the Tap Points and the HPGN points for 30 minutes in a sequence that optimizes production and all roving receivers complete their point assignments at nearly the same time. The base receiver is then moved to a point located approximately 1/4 – 1/3 the length of the Section from the other end of the Section, and all points are occupied a second time (this includes the pre­vious base station). The intent is that every point is measured with an independent short and long vector and the maximum length is limited to about seven miles except for vectors connecting the base stations to the CGPS stations. PROCESSING: In the post-processing, vectors (baselines) will be computed from each base to two CGPS stations using a minimum of two hours of observations. A primary network of six vectors will be created connecting the two Base Stations and the two CGPS stations with a clo­sure on the second CGPS station. The vectors will be processed in each Section from CGPS station P202 to the Base Station points and then to P200 or P201 as listed below. Two vectors are processed between the Base Station points. Vectors will then be processed from each base station to the other points occupied in the survey resulting in two independent vectors to each point. In the network adjustment, the result is an over determined system in which the position of the base stations are very well known. The residuals at the secondary points (new points, Tap Points, HPGN) resulting from the two independent vectors are indicative of the accuracy of each point and are expected to be less than 2 centimeters with unobstructed observations. ADJUSTMENT: A minimally constrained network adjustment will be processed by constraining to CGPS station P202. The vector residuals, differences at the other CGPS station and HPGN stations will be listed and forwarded along with an exported ascii file of the final vectors to the County Surveyor for QAQC analysis. The County Surveyor will review the results for all companies, compare the Tap Point positions derived from adjacent Section surveys, and determine if the adjustment is accept¬able. Once all four surveys are accepted the vector files will be combined in a single network adjustment constrained to the three CGPS stations resulting in latitude, longitude and ellipsoid heights, and grid coordinates that will satisfy the Public Resources Code for filing in a Record of Survey(s). Note, station velocities may be a consideration in designing the final adjustment constraints. BOUNDARY CONTROL SURVEY: Suggest the 14 firms be assigned point number ranges from north to south beginning with area one 1001¬1499, area two 1501-1999, area three 2001-2499 etc. Suggest a minimum of three primary GPS control points be included in conventional traverses along the ridges unless a company establishes secondary GPS control. Adjustment methods and reporting for conventional measurements need to be addressed to assure uniformity across the project. Broadcast Ephemeris is acceptable, however, the Rapid Ephemeris is available the next day with the CGPS rinex data and is preferred. Satellite observations will be collected at 10 degrees and processed at 15 degrees unless dictated otherwise by processing results. Minimum occupations shall be two times on all points under different satellite constellations. Minimum satellites to be observed simultaneously at base and rover is 5 satellites that are clear of obstructions. This will require pre-planning with obstruction diagram and satellite availability software. Minimum time of observation is 30 minutes for rovers and 2 hours for vectors connecting base stations to CGPS stations. Epoch interval for data sampling shall be 15 seconds. 5 second is acceptable but does not contribute to the solutions since CGPS and CORS generally run at 15 or 30 second epochs. Repeat station observations must be a minimum of one hour apart in time. Antenna measurements shall be recorded in feet and meters at the beginning and end of each occupation when using a tripod setup. Fixed height poles (four legged) are recommended. Tripod/Tribrach and Fixed Height Poles will be calibrated with a total station and be within 1 millimeter of plumb. A report on the calibration will be included in the survey report. NGS antenna models (available on the NGS web site) will be used in post processing. Obstruction Diagrams will be prepared for all points and used to pre-plan the best times for occupying a particular point. The best time is dictated by having five satellites clear of obstructions (not attenuated by foliage) with as PDOP of 5 or less. Base Stations must have a clear horizon above 15 degrees and not have any nearby objects (minimum of 20 feet) or reflective surfaces that may be a source of multipath. Occupation Logs will be kept for each receiver session (occupation). The information will include the operator, company, receiver make/model, antenna make/model, setup configuration (tripod or fixed height pole), start, stop times, antenna height in meters and feet, station description, to reach instructions, obstruction diagram, and weather conditions and will note any significant events affecting the data collection. A standardized log form using a form approved by the County Surveyor will be provided. Obtain photos of each point visited including a close up and distant picture. Clearly mark each point with their ID. 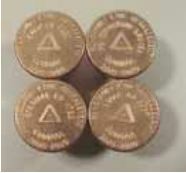 Residuals allowed in north and east component not to exceed 1 centimeter, and 2 centimeters in height. Adobe Associates believes in community, and in making a difference in the lives of our neighbors. Through our contributions to local non-profit organizations, we aspire to have a lasting impact as we help improve the fortunes of those around us.